This cash flow reconciliation template will help you differentiate between EBITDA, CF, FCF and FCFF. There are major differences between EBITDAEBITDAEBITDA or Earnings Before Interest, Tax, Depreciation, Amortization is a company's profits before any of these net deductions are made. EBITDA focuses on the operating decisions of a business because it looks at the business’ profitability from core operations before the impact of capital structure. Formula, examples, Cash FlowCash FlowCash Flow (CF) is the increase or decrease in the amount of money a business, institution, or individual has. In finance, the term is used to describe the amount of cash (currency) that is generated or consumed in a given time period. There are many types of CF, Free Cash Flow and Free Cash Flow to FirmUnlevered Free Cash FlowUnlevered Free Cash Flow is a theoretical cash flow figure for a business, assuming the company is completely debt free with no interest expense. It's used in financial modeling to calculate a company's enterprise value. The formula = EBIT - Taxes + Depreciation & Amortization - Capex – Change in Working Capital. EBITDA can be easily calculated off the income statement by adding to the net incomeNet IncomeNet Income is a key line item, not only in the income statement, but in all three core financial statements. While it is arrived at through the income statement, the net profit is also used in both the balance sheet and the cash flow statement. the taxes, interest, depreciationDepreciation ExpenseDepreciation expense is used to reduce the value of plant, property, and equipment to match its use, and wear and tear over time. Depreciation expense is used to better match the expense of a long-term asset to the revenue it generates. & amortization. Operating Cash FlowCash FlowCash Flow (CF) is the increase or decrease in the amount of money a business, institution, or individual has. In finance, the term is used to describe the amount of cash (currency) that is generated or consumed in a given time period. There are many types of CF is a measure of cash generated by a business from its normal operating activities. Like EBITDA, depreciation and amortization are added back to cash from operations. However, all other non-cash items like stock-based compensation, unrealized gains/losses, or write-downs are also added back. Operating cash flow does not include capital expenditures. Free Cash Flow, also referred to as “Levered Free Cash Flow” or “Cash Flow to Equity”, can be easily derived from the statement of cash flows by taking operating cash flow and deducting capital expenditures. FCF is the amount of cash flow available for discretionary spending by management/shareholders. 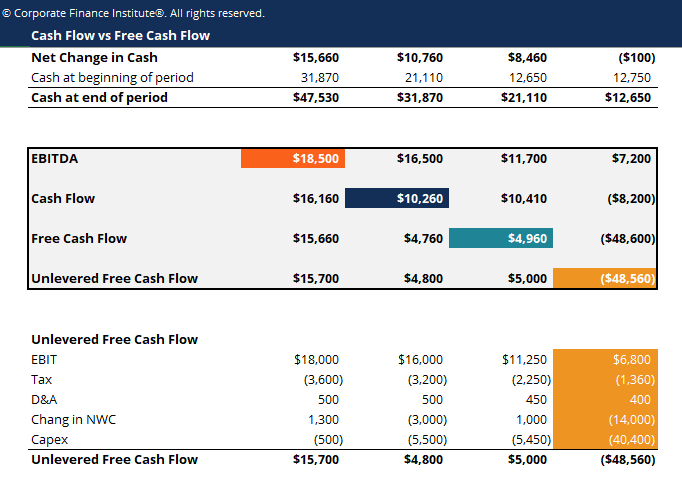 Free Cash Flow to the Firm (also called Unlevered Free Cash FlowUnlevered Free Cash FlowUnlevered Free Cash Flow is a theoretical cash flow figure for a business, assuming the company is completely debt free with no interest expense. It's used in financial modeling to calculate a company's enterprise value. The formula = EBIT - Taxes + Depreciation & Amortization - Capex – Change in Working Capital) requires a multi-step calculation and is used in Discounted Cash FlowDiscounted Cash Flow DCF FormulaThe discounted cash flow DCF formula is the sum of the cash flow in each period divided by one plus the discount rate raised to the power of the period #. This article breaks down the DCF formula into simple terms with examples and a video of the calculation. The formula is used to determine the value of a business analysis to arrive at the Enterprise Value. It is calculated based on the assumption that the firm was to have no debt.